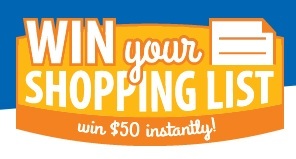 Kroger/Fry’s is running another instant win game to coincide with their latest Mega Event: Win Your Shipping List. From now through September 18 at 11:59pm PDT you can play the game daily for a chance to win $50. Winner’s will have their prize loaded directly to their loyalty card.